What’s not to love about cherries? With their luscious flavor and vibrant shades of red, it is hard not to find them appealing, but there is far more to this fruit than meets the eye. In addition to the fascinating history, botanical variety, nutritional value, and growing tips, this beautifully photographed book provides an impressive list of cherry-based recipes. The featured recipes cover a wide range of culinary fancies, from a classic Cherries Jubilee to the more adventuresome Roasted Pheasants with Cherry Champagne. 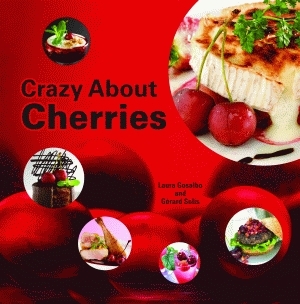 Previously published in Europe, Crazy About Cherries, Spanish edition, won the 2005 Gourmand Word Cookbook Award for Best Single Subject Food Book, and the German edition of the book was awarded the German Gastronomic Academy Silver Medal in 2007. With the cooperation of the Northwest Cherry Growers in the United States, the American edition adds sixteen lip-smacking recipes, U.S. measurements, special cooking tips, and a glossary to ensure the tastiest outcome in recipe preparation. Far more than an engaging cookbook, this is a complete reference guide for anyone who has wanted to know more about cherries. Laura Gosalbo earned a master’s degree in food chemistry from the Chemical Institute of Sarrià in Barcelona in 1989, followed by a doctorate in chemical sciences and biochemistry from the University of Barcelona in 1995. She is the owner of Gastronomía Activa in Barcelona, which promotes the culinary heritage of different countries. Gosalbo dedicates her time to ensuring that producers and consumers work together to form healthy food habits, techniques, traditions, and new trends. Gèrard Solís is chef at El Racó in Sant Climent de Llobregat, a restaurant near Barcelona. He also works in several other prestigious restaurants around Spain. In addition to being a chef, Solís promotes special culinary products specific to his region and appears on the cooking show Cuines on TV3. He lives in Barcelona with his wife and daughter. Click here for the Index.